These are four seemingly simple words that could change one’s life. Four words that could be said in a hundred different ways. This love month, three couples share with us their real-life romantic proposals. Kathlyn and Aidel said their respective thanksgiving prayers for finding each other. She says, “For me, it isn’t an engagement ring that symbolizes his proposal to me but his thanksgiving prayers.” Guided by their faith and love for each other, they are happily planning for their march down the aisle this October 18. 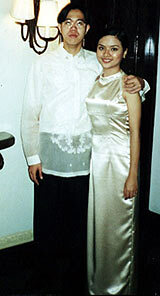 For Monette Crisostomo, boyfriend Jonathan David’s proposal was surprisingly sweet, figuratively and literally speaking. Sweet Dessert: Monette and Jonathan. On their way to Makati, Jonathan’s office mate called him up and they started talking about business. Monette could not help but overhear that a client was expecting Jonathan somewhere in Makati. “After talking on the phone, he apologized and asked me to go with him to the Citibank Towers to meet his client. I was really disappointed because I thought we were going to relax and take time off from work but I had no choice but to accompany him,” says Monette. As they got to the 34th floor of the building, Monette was surprised to see a restaurant, which turned out to be the Top of the Citi. “We went inside a candle-lit room with background music which he reserved just for the two of us. It was really romantic! I could not help but cry then,” she remembers. A waiter entered the room and handed Monette a bunch of red roses. After a hearty dinner, dessert was delivered. “Suddenly, I noticed the ring on top of the ice cream with strawberry in a glass. Beside it were chocolate engraved writings, “MONETTE, I LOVE YOU VERY MUCH! WILL YOU MARRY ME?” My heart leaped with joy, and so, I embraced him and I answered yes!” says Monette. 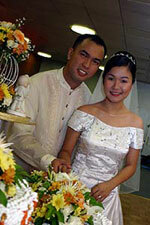 They had their beautiful wedding last December 14 at the St. John Bosco Parish. Inspired? Are you ready to pop the question? Be sure to tell Kasal.com when you do so!